We don’t have any fall decorations out yet. No spicy candles. Pretty harvest colored accents around the house. Nothing. So when daughter and I were at the store a few days ago, I asked her to grab a pumpkin. Me: We should at least have ONE pumpkin outside. Daughter: Do I HAVE to go get one? Daughter came back with what must have been the nastiest pumpkin in the bin. Me: THAT one? You picked that one? It’s yucky! Daughter: What? I like the warty things all over it. It’s got character. Daughter: But it’s fun. We can make it into a witch. Or something. So that is why there is a gross pumpkin by our front door. With any luck, I will get on task this weekend–And there will soon be pretty fall decorations inside and outside our house. For now, there’s just the ‘ugly’ pumpkin. She’s back! We really missed your blogs Amy! The ugly pumpkin was very entertaining. 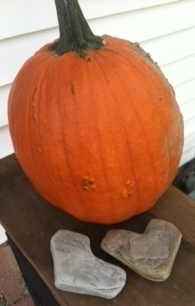 There is no such thing as an ugly pumpkin, they are all original and young Katelin Rose is very original,eh! Thanks…I’ve missed posting. I seem to not have time to sit down and write lately!